When flying out of Duluth on NWA planes typically start their bank for the Twin Cities north of Proctor and fly over Esko, depending on which way the wind is blowing. For a number of years I have looked down at a railroad bridge located between Midway Road and Stark Road on the Spirit Lake/Interstate Branch, now a part of CN's Superior Subdivision. This bridge over the Midway River involves a little bit of a hike in from Stark Road, but not bad. I always told myself I should walk in there and see what kind of angles were available. Well, yesterday I ran across a short 5-car L-567 (Virginia local) southbound with CN 6000, a rebuilt SD40. RTC was going to hold him at Adolph for a core train climbing Steelton Hill headed up the Rainy Sub. The sun was out, the temps around +50F, and the snow was packed enough to walk on. A perfect time to check out the bridge after all these years of saying "someday" to myself. I walked in and down to the river bank and set up. It is a tight shot on the west side but given this train was powered by a "one unit wonder" it would fit nicely. I was pleased with the result. You can tell that the DM&N built this bridge to withstand tonnage and it shows, even if this was just a "branch" in the grand scheme of things (serving the Duluth Works and as an outlet for all-rail and interchange ore). Concrete and steel with no timber was a hallmark of most Missabe bridges (it helps when you are owned by a steel company). As a stark contrast to that bridge is the DW&P span over the same river, located a few miles downstream. Despite being built at the same time as the DM&N bridge (around 1911), the DW&P followed a more traditional timber and steel approach. 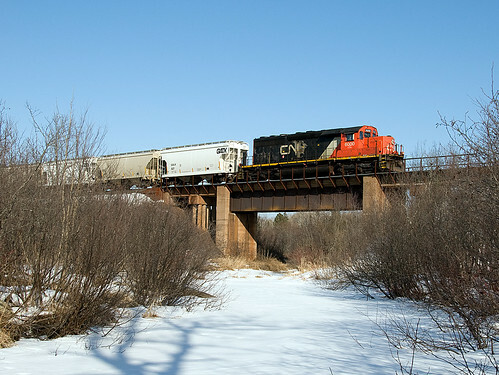 It is bridges like these and the general engineering difference between the former DM&IR and DW&P that resulted in CN directionally running predominately empty northbounds over the Peg and heavy loaded manifests south over the Missabe. Although you can catch CN manifests running both directions on either line, they are fairly predictable about using directional running for the core trains. I had scouted the DW&P bridge in the 1980s but back then there were far fewer trains on the Peg and I never did manage to get a shot. This bridge is also very visible from the air and it has been on my "to do" list for years. With CN swallowing up the Missabe, my photography efforts are turning more towards new location shooting versus "chasing" every generic train I come across, although old habits are hard to break. To that end, this morning I noticed a CN SD70M-2 on the head end of L-567 (with 6000 as power again) running long-hood-forward up Steelton Hill. The 8023 was a helper for the local, and what goes up, must come down. 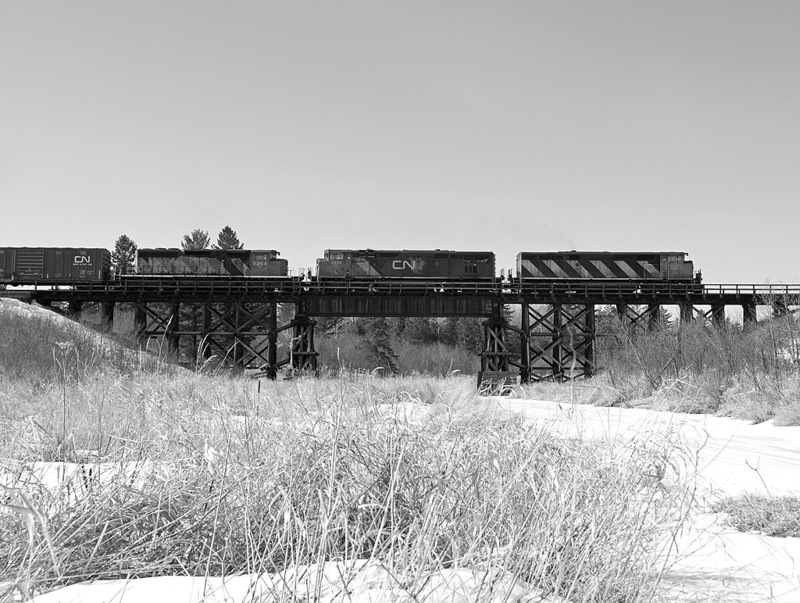 I thought this might be a good opportunity to shoot the returning light engine on the trestle, given it would be facing the proper direction, the sun was out, and temps were pushing +50F - a carbon copy of yesterday's "cabin fever" day. I had wanted to shoot the big engine from the east side of the bridge which favors morning light and is wide open, but CN threw a wrench into the plan when RTC released M-343 from Pokegama just as L-567 reached Simar, with the local and its helper instructed to wait in the siding until 343 passed. This delayed the return of helper 8023 by almost 2 hours - preventing nice sun on the east side. I did get a somewhat top-lit image of 343 with a pair of GE cowls and an SD40-2 for power (you can tell the economy is hurting, this guy only had 60 cars). The grayscale treatment actually looked a lot better than the color image. The west side of the bridge is a tight shot for southbounds given a couple of big pine trees and tall scrub brush on the south bank, but with a wide angle you can make it work. Northbounds in the evening during summer would work better from the west side. The delay did help as the sun swung around fairly well and the single unit fit on the enter span beautifully. Come summer I'll have to play a littler more with these bridges!